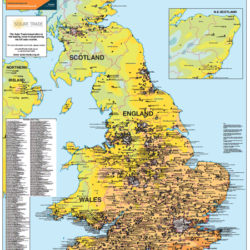 Britain - SolarPV, Installations and Resource map - 5th Edition, October 2018 Produced in association with the Solar Trade Association the map basically shows the Solar PV installations in Britain over 1MW. These are differentiated by symbol and symbol colour gives an indication of site status. The name of the site, site operator and generating capacity is attached to each symbol. The map shows projects which are built, under construction or consented. All this is shown against a background which shows the solar insolation resource. The pdf and digital print versions of this map are updated to October 2018. Current edition 2nd edition (June 2016). This is the first and only map out which shows the built Solar PV installations in Europe over 1.0MW. The map shows the site location of all built PV installations. Each installation is shown by symbol and the site name, generating capacity and site operator/owner is attached to each symbol. 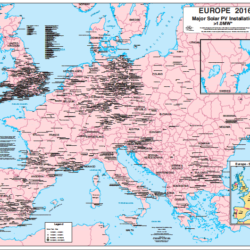 The Europe - Major Solar PV Installations map was launched at Intersolar 2016 in Munich, Germany in June 2016. 2nd Edition, November 2018. 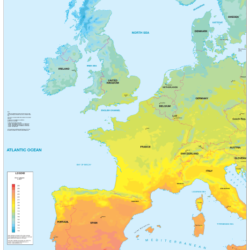 This map, produced in association with the Irish Solar Energy Association (ISEA) builds upon a map/educational poster explaining what is solarPV ands its benefits to an Irish audience published in 2016. The 2018 map covers both Northern and Southern Ireland and shows around 700 utility scale Solar PV project. Symbol colour depicts whether the project is in EPC 1, Grid Contracted & consented, contracted only, consented only, in planning or has applied for grid. Buildout will probably not after the auction round in late 2019. The major rooftop projects are also shown. Each site is shown by location. Symbol colour shows status. Attached to the symbols is the proposer/operator and the generating capacity of the site. All this is shown against a generalized background showing the solar resource..
1st edition, May 2013. This is a map on average solar insolation (w/m2) in Western Europe. It is based on ten years satellite data on a high resolution grid (4km). The colour graduation ranges from 100-260 w/m2. This map was produced to show that in Northern Europe the distribution of solar farms is not related to resource. 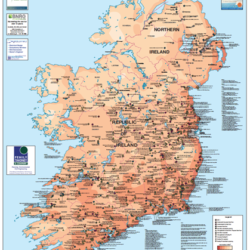 This is a map/educational poster published in association with the Irish Solar Energy Association (ISEA). The map is an average solar insolation resource map (how much sunlight does Ireland get and its distribution) with the published grid connection application points superimposed on the map. A mixture of text, pictures and graphics on the map surround explains what SolarPV energy is, how it is works, the different types of SolarPV (ground mounted v roof mounted), how it is exploited and the benefits to the economy, industry, agriculture and the environment. The map/poster is available free but a small administration fee is charged to cover packing and postage. 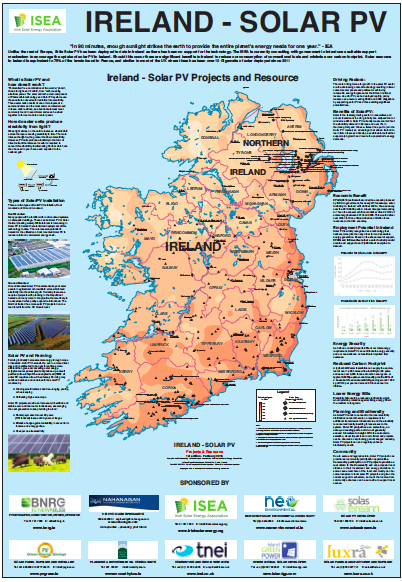 Currently only available as a pdf file or printed to order - The map compliments the published map on British Solar PV Installations and Utility Scale projects the utility scale Solar PV industry in Ireland North and South. Currently there are about a dozen projects in the North of Ireland from consented through to built. In the republic there are two consented (planned) projects and almost 100 grid applications for solar projects. Each site is differentiated by symbol and symbol colour gives an indication of site status. The name of the site, site operator/applicant and generating capacity is attached to each symbol. The map shows projects which are built, under construction, consented or proposed. All this is shown against a background which shows the solar insolation resource.